Pearls are the gems of the ocean. 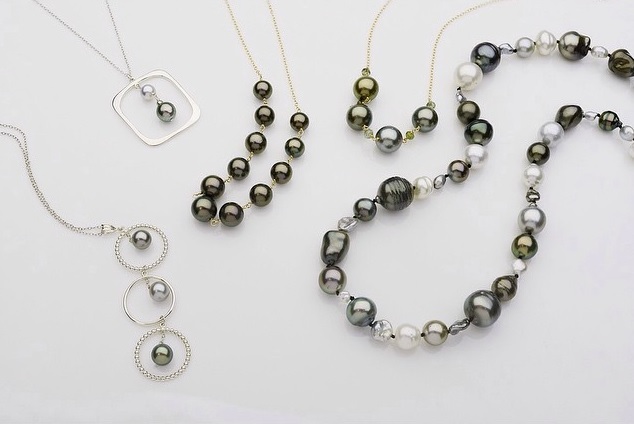 Tahitian Pearls are dark and exotic and they look beautiful with so many different outfits! Often referred to as black, they actually have a remarkable color range that covers the spectrum! Quote: "Coco Chanel used to talk about wearing more than one string of pearls. Why wear one if you can wear two, or something to that effect. I think that one string of pearls is just fine. But that's because my pearls are black, hers were white.” --C. Joybell C.
About our Sponsor: "Founded in 1996 and brought online in 2000, Pearl Paradise has grown into the world's largest online pearl company, with 2006 sales topping $20 million. With a custom-built, 1,400-cubic-foot vault filled with pearls, we offer a selection of pearls unlike any other pearl seller, online or off. Our commitment to offering prices 80 percent below retail has accelerated our growth. With more than 100,000 satisfied customers to date, we have benefited greatly by word-of-mouth advertising. Our commitment to quality, customer service, and unbeatable pricing and selection has helped us become the Internet’s premier source of pearl jewelry." A GAL NEEDS...and PearlParadise.com along with some other amazing bloggers have partnered up to bring you an amazing giveaway! 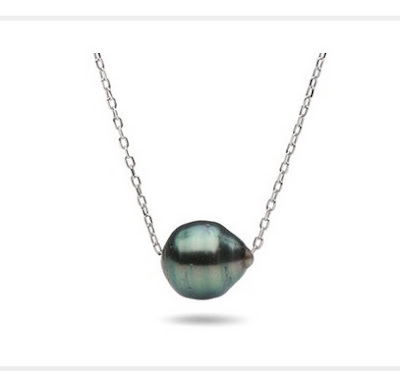 Giveaway: One lucky winner will receive a Cherish Collection Tahitian Baroque Pearl Pendant, like the one pictured above. It will be between 10.0 and 11.0 mm and come with its own certified appraisal. Often the appraisal is significantly more than the actual online retail price! Retail price is $180.00. Read more about this pendant at A GAL NEEDS... review here! I don't think I've ever seen a Tahitian black pearl. They're beautiful! I love that necklace. I did not know there were so many different colors of pearls! I really like the black pearl bracelet. I love the Chocolate Tahitian Pearl Stud Earrings. Love the color. Tahitian pearls were once the rarest, most valuable cultured pearls in the world. 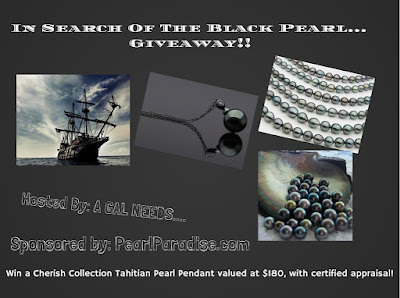 My first and middle name in Irish Gaelic means Pearl Dark............so I am all about the black pearl bracelet! I didn't realize how rare they are! I am crazy about the Golden South Sea Pearls. Wish I could afford them! Tahitian pearls are among the largest pearls. They are mostly said to be blavk, but come in a wide variety of colors. So many beautiful colors, had no idea! My girl loves pearls ! I didn't know Tahitian pearls were commercially farmed. These pearls are so elegant and sopisticated....I really like this pendant, where the lone pearl really stands out. Everything is so pretty! I love the White Akoya Pearl Bracelet. I love the Classic Collection White Akoya Pearl Dangle Earrings! I learned that Although color does influence the value of South Sea pearls, it does not necessarily influence the grade. A strand of AAA grade golden South Sea pearls of a light yellow coloration, for example, may be worth much less than an equivalent strand of deep, naturally-gold colored pearls. I fell in love with The Hera Collection Tahitian Pearl and Diamond Ring. It's stunning, but simple at the same time. Gorgeous design and Pearl. I like the 7.5mm white Akoya studs. I think it is very interesting the prices they range in! I learned about all the colors of Tahitian pearls and that I would love a Multicolor Tahitian Round Pearl Necklace to enjoy them together. I love how unique these pearls are! I definitely them to the standard pearls you typically think of! LOVE the Tahitian Baroque Pearl and Leather Bracelet!!!! I love the Black Akoya Pearl Bracelet. I absolutely love the Embrace collection golden south sea pearl pendant in silver! Just gorgeous. Thanks for the giveaway! I have always wanted a black pearl necklace but have never been able to afford one. This way I can and don't have to have lots of pearls to enjoy their beauty. Black Pearls are very beautiful ... would be lovely to own one! I didn't know these pearls occurred naturally. I like the 7.5-8.0 mm Natural Golden Akoya Studs. Thanks for the chance! I didn't realize that tahitian pearls don't actually come from Tahiti! I learned that Tahitian pearls are among the largest pearls in the world and range in size from approximately 8 mm to 18 mm. The beauty of Tahitian pearls is not limited to their size, but their incredible array of iridescent colors. Tahitian pearls are gorgeous! I like the 8.5-9.0 mm Pink to Peach Freshadama Pearl Bracelet. The color is awesome. I learned that Black-lip pearls are farmed in French Polynesia, the Cook Islands, the Micronesian Islands, and even to some extent, Japan, Thailand, and the Philippines, but only those grown in French Polynesia may be called Tahitian pearls. I love the 7.0-7.55 AA+ Black Akoya Pearl set. Unlike black freshwater and black akoya pearls, which have been irradiated or dyed, Tahitians come by their dark color naturally. LOVE ALL THE COLORS AND PEARLS!! lOVE TO WIN! I love the beautiful colors they come in!